The town is in a wide valley between high mountains. The valley is about 1,900m above sea level. Overlooking the town is 5,600m Jade Dragon Snow Mountain, part of a range of mountains that extends to the Himalayas. 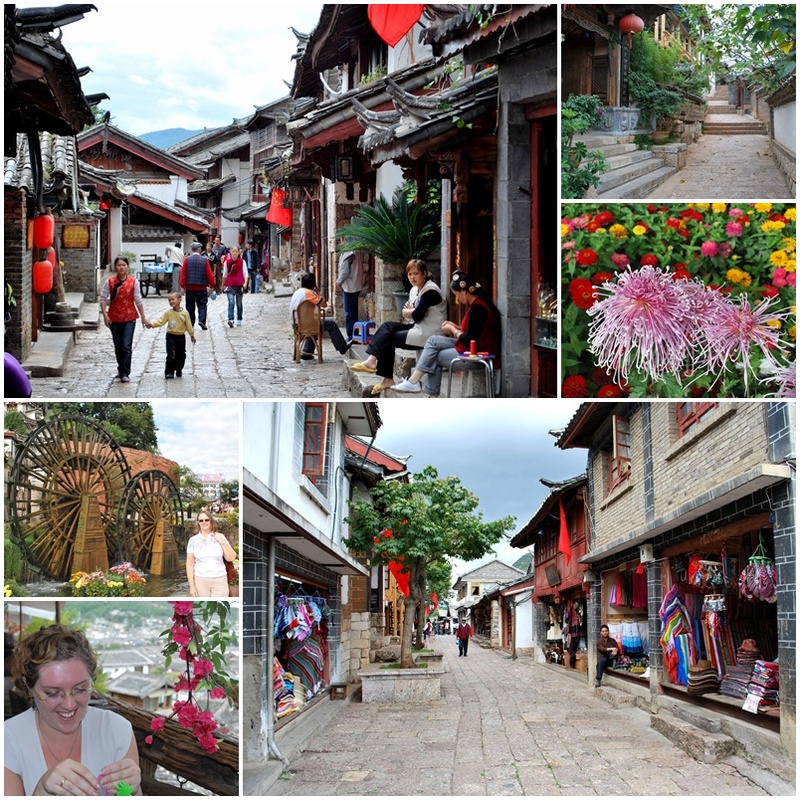 I had booked rooms for us in a hotel in the Old Town of Lijiang (THD Inn – Tao Huang Dao, meaning Peach Tree Island). Since the Old Town is open to pedestrian traffic only, we had to call the hotel to send someone to come get us and bring us in. There were a lot of stairs to carry our cases down but all was soon forgiven. I’d booked a slightly more expensive room for my parents because it was supposed to have a view of the Old Town. When we arrived in the room I gained massive brownie points. Although their room was slightly smalller than mine, two whole walls were windows giving a 180 degree view of the Old Town spread out below. It was really incredible. The Old Town itself is fascinating to wander through. It’s become quite the tourist trap, with almost all of the buildings seeming to be hotels, shops, or bars/restaurants, but very interesting nonetheless. Canals red by the Jade River twist through the whole place, with lots of willow trees beside them. Being national holiday time, there were also lots of flower displays. That first night we wandered the place til after sunset, then ate Over-The-Bridge noodles and a local style fish dish recommended by the waiter. The next day we went to Black Dragon Pool park. The Black Dragon Pool itself is about 40,000m2 of water where the Jade river pauses before flowing into the Old Town. It was gorgeous place to wander – views of Jade Snow Mountain over the clear blue-green lake full of red and black goldfish, with the willows and other trees that line the lake creating a multi-coloured reflection. We took a LOT of photos. We stopped and sat by one little corner of the pool for quite some time. I was entranced by the crystal clear water with its pale aqua tint. Every pebble was so clear the water could have been only an inch deep, but judging from the size of the fish swimming around it must have been half a metre. The park itself was built in 1737 but much of it has been rebuilt over time. The oldest building was actually moved there from another place. On the way out we followed the Jade River until it became canals into the Old Town. We found a small hotpot restaurant by the canal and I bullied the waitresses into letting us sit upstairs.The collection of local vegetables and various mushrooms that came seemed odd to me but the parents really enjoyed it anyway. In the afternoon I ate toast with local creamed honey at a canal-side restaurant (with a lot of foreign influence – hence the toast!) reading a book in the sun while the parents napped. Later we found our way to the temple on the top of the hill behind the Old Town and marvelled at the 360 degree view of the city (old and new) and the surrounding mountains. We found the back way into our hotel and snacked at its cafe – tables along a narrow walkway with an incredible view of the Old Town as the setting sun played on the mountains. Dinner was street food bought from a lady selling snacks by the cobbled paths of the Old Town – spiced skewers of potato, vegie-balls, and lamb. I’d arranged a car with driver to collect us from the hotel in the morning. 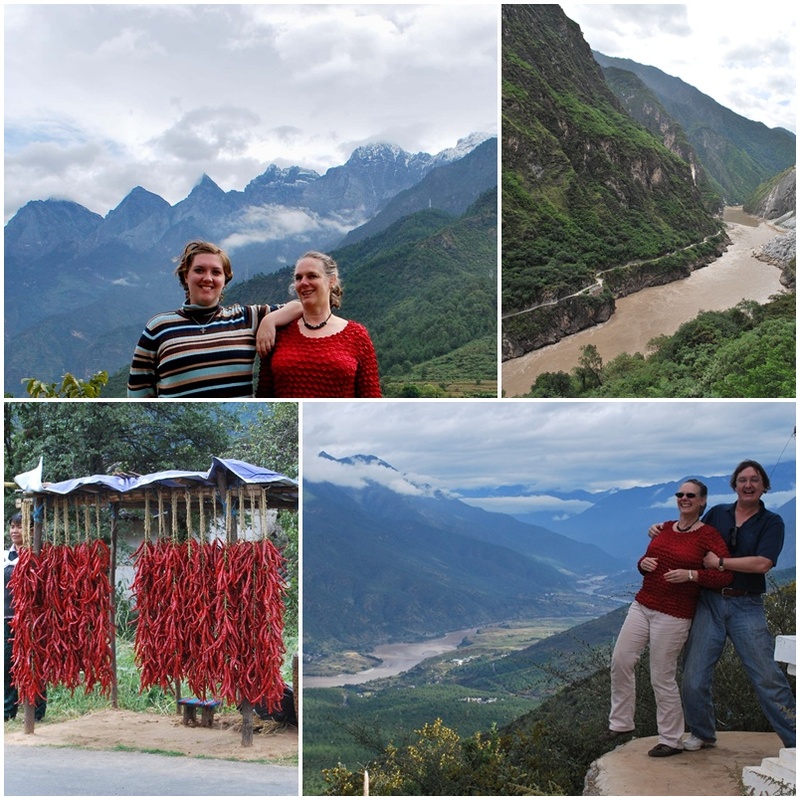 Our driver was to take us out to Tiger Leaping Gorge and back to the airport for our evening flight to Jinghong. 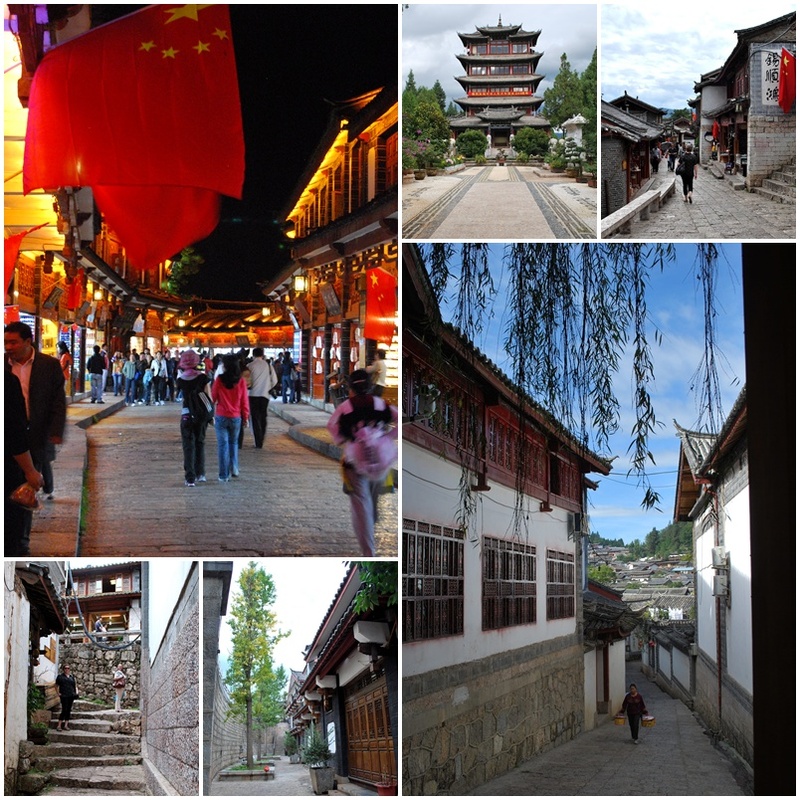 It was a HUGE contrast to our trip from Dali to Lijiang. This driver was amazing. He gave us interesting information about the area, stopped at a few places along the way where there was a good view to be seen, and drove very smoothly and safely. He was such a good guy that even certain misguided comments made to me (“You don’t need a seatbelt because you’re fat” and “You’re not that fat in your own country, are you? It’s just cos you live here, right?”) weren’t too hard to forgive and forget. First we climbed the mountains out of Lijiang, with our driver pointing out clusters of houses that formed small Naxi villages on the slopes below us. He stopped at a lookout on the way, saying it was worth a look. The view of the Yangtze, so small beneath the huge mountain range behind it, was breathtaking. I just stood there for a while trying to drink it in. We then wound around and down to the river valley. We crossed to the Shangri-la side of the Yangtze and drove down to the gorge itself. Before we hit the entry gates, our driver stopped by the side of the road where we’d have a good view of the Thirteen Peaks (although we couldn’t quite see all of them). These sharp, snow-covered crags, about 5,000m above sea level, were amazing – photos just do not do the scenery justice. In less than half an hour the peaks were covered in cloud which did not lift the rest of the day. Stopping when we did meant views (and photos) we wouldn’t have had otherwise. 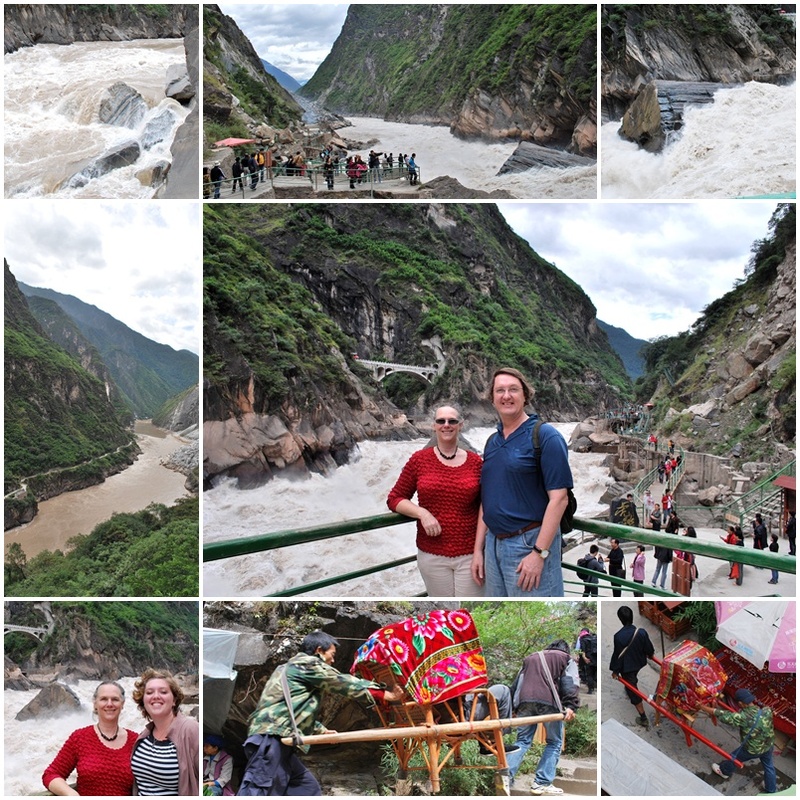 The 15km long Tiger Leaping Gorge is one of the deepest river canyons in the world. It is the narrowest point on the Yangtze River, as it flows between Jade Dragon Snow mountain (5,600m) and Haba mountain (5.400m). The name comes from a story where a tiger leapt across the gorge (stopping on a rock in the middle of the river) to escape a hunter. Again, the pictures don’t do it justice. The rapids are insane – only crazy adventurers would attempt to navigate it by boat. In the early 80s four guys on a raft attempted it and were never seen again. A few years later a group did it successfully but I for one definitely will NOT be giving it a go. The main tourist spot (where we went) is the very narrowest point, where the river is only 20m from bank to bank. 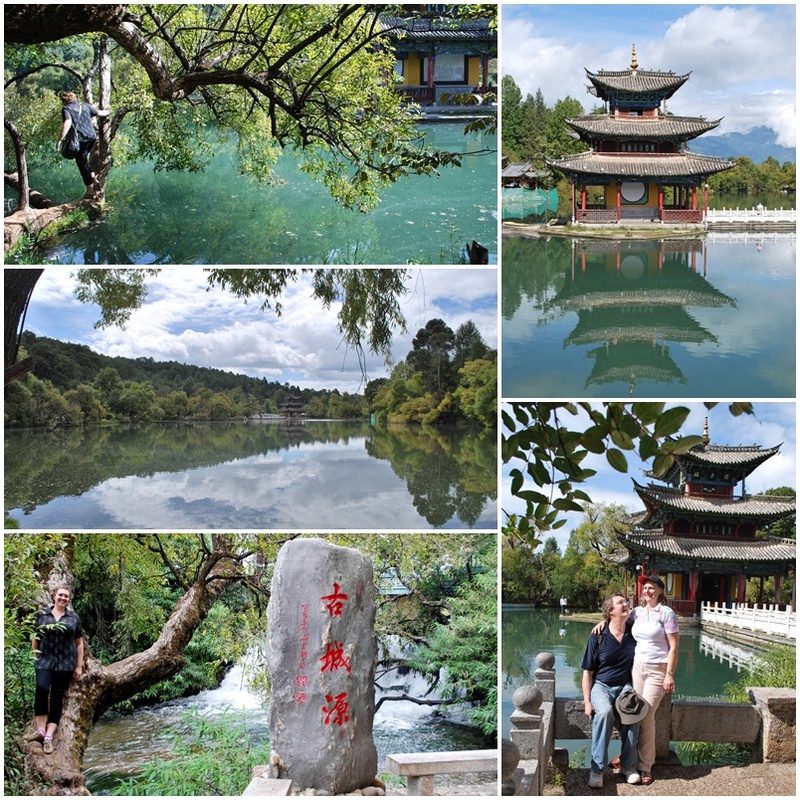 On the Lijiang side of the river, a fairly flat 3km trail winds along the river to the gorge. On the Shangri-la side, where we were, a 1km loop of wooden stairways leads to the floor of the gorge and back up again. A steep and tiring climb (many young men bearing sedan chairs hawk the benefits of reclining your way up!) but takes less time. Despite the awesome beauty of the gorge, however, my deepest impressions of the day came from the view at the first lookout, and the view of the Thirteen peaks – those vistas were more than my mind could take in. Also, the villages and farms we passed along the way were fascinating. Mum kept a running tally of crops we saw on our trip – the list was huge. That day alone we saw corn, pumpkins, chillis, tobacco, sunflowers, rice, beans, walnuts, peaches, apples, and probably a whole lot more I can’t think of right now. After leaving the gorge I had the driver find us place for lunch. He stopped at a small restaurant by the side of the road, high on the Shangri-la side of the Yangtze. It was set up for bigger groups (I assume some tour groups go there) but we were the only ones there that day. It took a little persuading but the driver eventually agreed to join us for the meal. I ordered a few simple dishes and the driver suggested we have some fish. He looked at the concrete tubs by the door that served as tanks for the fresh fish and said that they didn’t look so good and recommended some other type of fish that’s expensive but very good. We agreed to get that, whatever it was, and sat back to enjoy the porch-like setting (bamboo armchairs and an open courtyard). After quite a while it occurred to me that they still hadn’t brought fish for us to okay – in China when you order fish they grab one out of the tank and show it to you for your approval before cooking it. Soon they brought the fish in a bucket and after a cursory glance to say “fine” I did some investigating. Turns out they had sent two guys down the hill to the Yangtze, where they’d pulled the fish from their nets and brought them back up to the restaurant! The soup style dish that resulted was delicious – definitely one of our best meals of the trip! We had some time to spare on the way back so we stopped briefly at Lugu Lake. On a less overcast day it must be a very beautiful place, but that day it didn’t seem anything too special. Eventually we got to the Lijiang airport, where we boarded our flight to Jinghong. The plane taxied down the single runway and turned around at the cul-de-sac end in order to take off, buffeted by the air moving over all those crazy high peaks. 45 minutes later we landed in Jinghong, which you’ll hear about next week in part three!